HA! performed by Bouchra Ouizguen’s dance group. Photo: Bomontiada Alt. 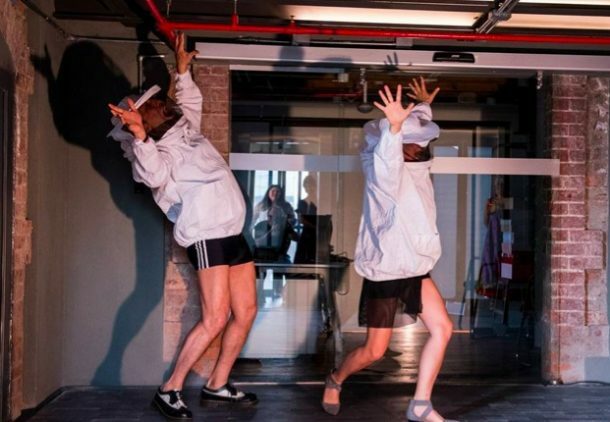 Istanbul has a fascinating, brand-new performing arts festival, “A Corner in the World Fest,” which was presented for the third time on May 2 to 13, 2018. What makes this festival different from other international experiments held in Istanbul or in other cities such as Bursa, Ankara, Adana in Turkey, is it not only devotes to performance arts but also contains contributions from the Arab world which regular Turkish audiences are not accustomed to attending at a festival. Taking its name from the idea that the world is round and the center of it can be any corner depending on one’s point of view, lead the organizers to their concept of looking at the world from different perspectives. This year the events were inspired by feminist writer and activist Andrea Dworkin, who said: “Women have been taught that, for us, the earth is flat, and that if we venture out we will fall off the edge. Some of us ventured out nevertheless, and so far we have not fallen off. It is my faith, my feminist faith, that we will not.” Thus, the festival started with a particular question: “The Earth is Flat?” and focused on the works of female and queer artists from Turkey, Iran, Syria, Algeria, Morocco, and Kosovo. Again, this year’s curating team (Burcu Yılmaz, Claire Zerhouri andFatih Gençkal) collaborates with Bomontiada ALT which has an important historical space that is a recently developed cultural district surrounding a historic beer factory right in the city center. 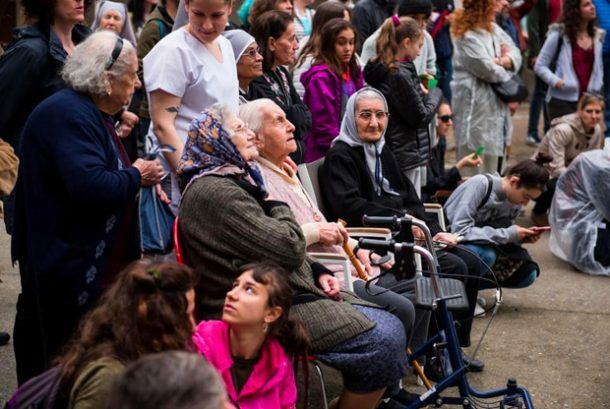 The festival events were spread through this district and enlisted the collaboration of Mimar Sinan University of Fine Arts Department of Contemporary Dance and another cultural center in the city, SALT Galata. A photo from the opening ceremonies on a rainy day. Photo: Bomontiada Alt. The festival began with an Iran/Belgium work A Reason To Talk, performed by Sachli Gholamalizad, a young Belgian actress of Iranian descent. It questioned her troubled relationship with her mother. The story tells how she had been taken to Belgium by her mother because of the war in Iran when she was a child. Now, in the performance, Gholamalizad blames her mother since her mother never shared her feelings and troubles from that time with her. 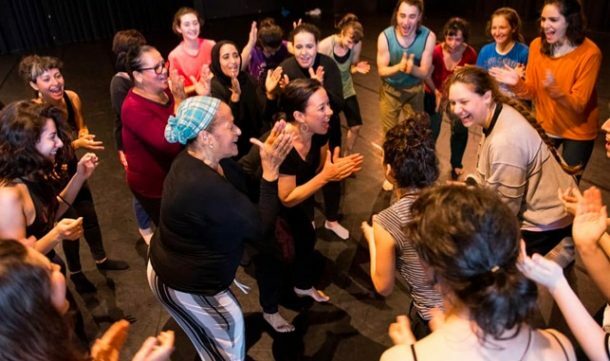 In this performance, Gholamalizad tries to find out how she can present her memory and her family’s past to confront both her mother and grandmother. 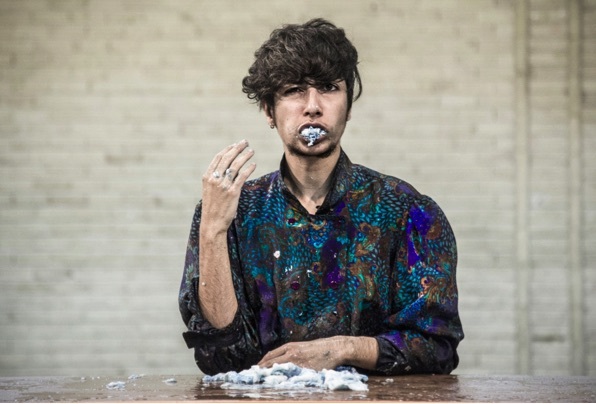 To do this, she combines various materials belong to herself such as self-created tapes both from Belgium and Iran, her diary, stories, and soundscapes which are shown on five different display screens controlled by the performer. A scene from the performance A Reason To Talk. Photo: Murat Dürüm. This was followed by a very inspiring performance from Lebanon, Jogging, written and performed by Lebanese actress Hanane Hajj Ali who is in her fifties. To avoid osteoporosis, obesity and depression, she exercises daily on the streets of Beirut. Along the way she remembers, dreams and thinks about her past, her experience and also the changing face of Beirut. Then she realizes that a foul smell of catastrophe overwhelms the streets of the city, recalling Shakespeare’s famous saying: “There’s something rotten in the state of Denmark.” Thus, using this routine jogging on the streets, she begins to tell her story, which is blended with the other women’s stories, particularly that of Medea, with whom she shares some commonalities. She tells the stories of three Medea-like women: the first is Hanane, the performer’s own self who decided to kill her cancerous son to relieve him from the pain and suffering. The second is Yvanne, an educated, intellectual woman who killed her three daughters by putting poisons into their fruit salads and then killed herself, recording all these crimes on a video. The last is Zehra, in her fifties, who wants her sons to become martyrs after her husband’s betrayal. Based on a storytelling form, the performance Jogging invites the audience onto the stage and gives them roles. For me, this was what made it different from other storytelling performances, at least from those we have attended in Turkey. Hanane Hajj Ali in Jogging. Photo: Murat Dürüm. The next performance on May 7 was from Morocco: HA! 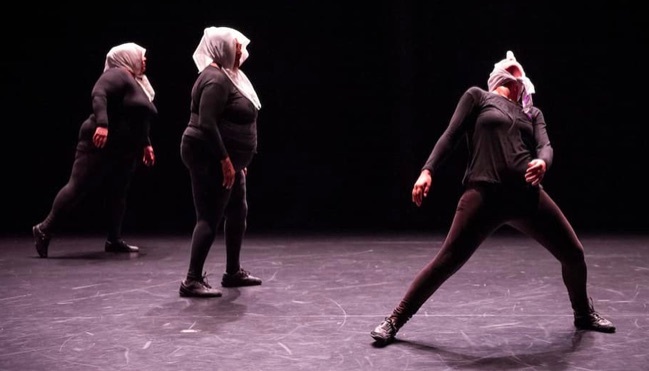 performed by an unruly dancing group founded by Bouchra Ouizguen. Ha! explores all kinds of madness in between genius and wisdom, both ordinary and bloodthirsty, isolating and liberating. Starts in darkness, the performance was inspired by the poetry of Jalal ad-Din Rumi. The performance. For fifteen minutes or so we only heard voices singing songs recalling the rite of the dervishes. The only things we could see on the dark stage are five white head scarfs. Then five middle-aged and heavy-set women in tight black clothes appeared. They were all in a trance and dancing in different ways. However, what was the relationship between madness and dancing in this performance? The artistic director and choreographer Bouchra Ouizguen has explained that in Arab culture madmen are numerous. There are also numerous remedies for them, including singing, dancing, mystical rituals, trances or shamanism. Starting from this point, she takes us on a journey through Morocco to delve into the relationship between our body and soul with our own obsessions. From the workshop of Bouchra Ouizguen with the audience on May 8. Photo: Bomontiada Alt. The other dance performance was Sur Le Fil (On the Thread) from Algeria/France, choreographed by Nacera Belaza and performed on May 11. Four young female dancers came to the center of the stage in regular turns, the only lighted place. It made me feel continuously being on/beyond the limits and borders of the stage/body/feeling. During the performance the dancing space enlarged and narrowed, changing the dancing subject according to the lighting. 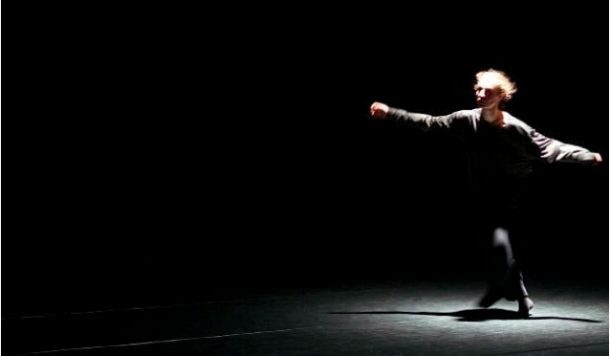 The dancing space became both on-stage and off-stage, seen and unseen, light and dark, appearing and disappearing, recalling Beckett’s theatrical universe. Sur Le Fil (On the Thread). Photo: Murat Dürüm. There were also performances focused on trans-gender concerns, coming from Kosovo and Iran. The first one was Unikat, performed by Astrit Ismaili and his sister Blerta Ismaili, who were famous child pop starts in Kosovo during the war in 1999. Unikat considers the relationship between sound and image, rising from personal experience but producing new possibilities of becoming for the audience. It also explored the politics of body and identity. What remains in my mind from this performance is the commonalities between the experience of seahorses and the performer Ismaili. After showing a video about how a male seahorse can give birth, the performer performs the same experience, emphasizing that there are one hundred fifty thousand different kinds of experiences and, thus, one hundred fifty thousand possibilities of becoming in this birth. What makes this performance impressively effective is its sound effects, which powerfully suggest vulnerability and emotionality, based on the human sounds produced while singing, breathing and whistling. Astrit Ismaili in Unikat. Photo: Murat Dürüm. On May 2, there was a performance called Video Call 2, dealing with the long-distance relationship which is common in our time. 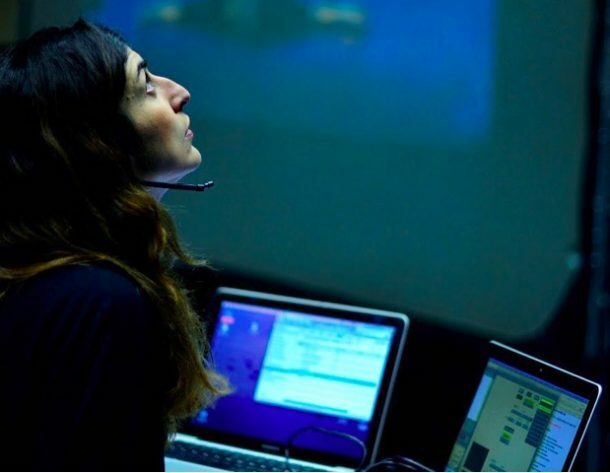 Created both as a video performance and live performance by a young Iranian artist, Pantea Armanfar, who also performed all the characters—Ava in the USA, her boyfriend Ramin in Tehran, and his mother in Tehran—shown in the video. The performer Armanfar first performed Ava, who was talking to her boyfriend on Skype. Towards the end of the performance, she also performed Ramin. 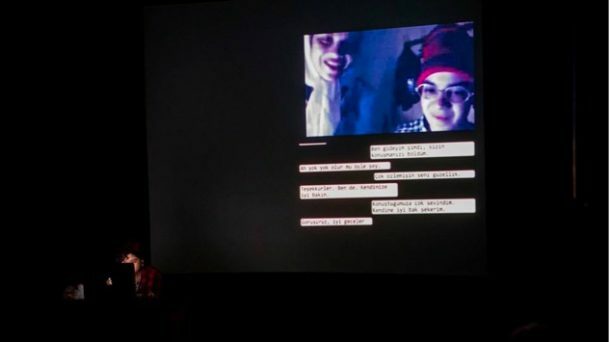 What this performance explores is how virtual communication can be lack of communication, how virtual relationship limits and changes the nature of the relationship. Pantea Armanfar in Video Call 2. Photo: Murat Dürüm. The final performance, Farci.e performed by Iranian artist Sorour Darabi on the evening of May 13, focused on the question of the relationship between gender and language. Darabi is interested in why everything has a gender in French while in his mother language Farsi, “gender” (pronounced “jenssiat”) means material. This is why s/he wonders about and explores the materiality of her/his gender, skin, and flesh. In his/her performance, s/he appeared in a disabled body and came to the full-lighted stage. What s/he performed included spitting, drinking water, tearing the papers on a table, then eating all the wet papers. Some audience members could not bear to see this and left early. It was never revealed what was written on the papers. It was probably some gendered French words, which seemed to the performer only an issue of materiality. Sorour Darabi in Farci.e. Photo: Mehrdad Motejalli. Turkish performances also made contributions to this festival: Light Theory, written and directed by Onur Karaoğlu, considered how the things we leave behind can shape our shared future and told a story of three persons forced to leave a place in different times; the performance Ellipsis by Fatih Gençkal and inspired by the Trojan Women investigated the landscapes of a new generation; Yellow Journey, by Zinnure Türe, was an audio tour through the streets of Bomonti that had witnessed the history of the Turkish Republic for over a century; and Hand Made, by Zeynep Günsür’s Movement Atelier, explored our hand-made life experiences. A Corner in The World Festival, offering concerts, video installations and workshops, talks with the artists, digital projections on tulle curtains showing selected women from Turkish cinema, readings season, was an effective encounter around the corners we all have. We were given a space to meet and a chance to share a sense of being together. 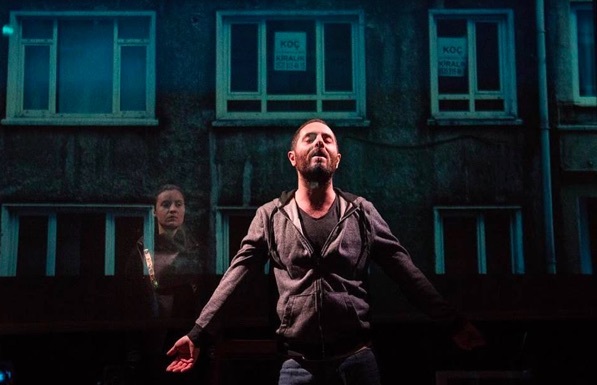 Okan Urun in Light Theory, written and directed by Onur Karaoğlu. Photo: Bomontiada Alt. A scene from Hand Made. Photo: Bomontiada Alt.